Take this one for a drive. I wanted a clean, easy-to-use interface, so I chose something nearly everyone is familiar with. 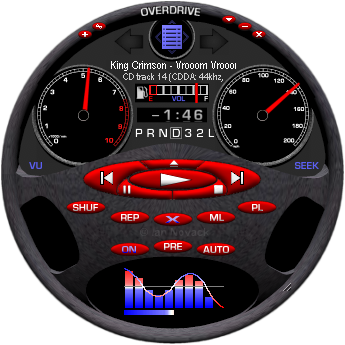 Tach moves with the music, while the speedometer is the seek. Wheel modeled in Caligari Truespace, dash in Bryce. Both textured and modeled in Bryce, and the rest done in Paint Shop Pro. Special Thanx to Duk, e-blackadder, ~ jonesyboy, *limnersphere, Nasir, ~noviwan, ~rhinotrip and Yyrk0on. Thats an original idea, going to try it! Very neat idea for a skin man. I really like the spedometers and the rest of the dashboard elements there. My only suggestions for this skin to to perhaps integrate the buttons in a bit more with the skin itself. They just seem to be overlayed and maybe should be inset within the background. Other then that though, nicely done. I wonder how it would look if you had leather-gloved hands gripping the wheel? The car lovers will emm...love it. Me?...em..no, i like motorcycles better.